Liquid crystals could one day be used as bio-sensors, detecting the presence of minute amounts of pathogens. That is the claim of a US group of researchers, who have demonstrated how a liquid crystal changes orientation in the presence of bacteria. Unlike normal materials, liquid crystals have a distinct phase between the solid, ordered crystalline phase and the disordered liquid phase: the liquid-crystal phase. In this phase, the molecules of a liquid crystal try to become ordered. 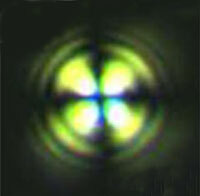 In a nematic liquid crystal like 5CB (4-pentyl-4'-cyanobiphenyl), for example, the molecules try to align lengthways. But liquid-crystal ordering is easy to disturb. If a liquid crystal is spread on a surface, even the tiniest scratch or speck of dirt can change the local order. This is why liquid-crystal displays must be made in ultra-clean environments. Nicholas Abbott of the University of Wisconsin-Madison and colleagues have found a way to exploit this sensitivity to contaminants. They dispersed fine droplets of 5CB in water, and then used polarised light to examine the resultant ordering. In spherical microdroplets, the 5CB molecules could not realise their preferred alignment, and instead stayed in a disordered, 'frustrated' state. However, once the researchers added very small concentrations of E.coli endotoxins - less than 1pg/ml - the 5CB molecules were able to relieve some of their frustration and align themselves. According to Abbott's group, the initial frustrated state of the liquid-crystal molecules leaves open defects, which the E.coli endotoxins interact with. Abbott thinks that this change in structure could be the basis for a bio-sensor. 'One could take a sample and add a small number of liquid-crystal droplets to it,' he says. 'Subsequent measurement of the optical properties of the liquid-crystal droplets would indicate if an endotoxin is present within the sample.' However, Abbott is not yet sure whether such a bio-sensor would be able to differentiate among different pathogens.